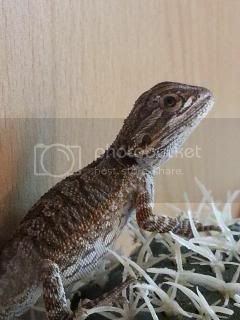 I have wanted a beardie since I was 13 i'm now 33 ha ha. I finally feel I have the time and ability to look after him (I say him I don't know yet). Voldemort is about 12 weeks old I have been informed. The pet shop I got him from was useless, I bought Voldemort as I fell in love with him there and then. I have a 4ft viv, with a basking spot set at 38 and a cool end at 29 (these are tested by a digital temp gauge). I also have a heat mat on the back wall in case of a sudden drop. The temp is controlled by a B1HT digistat with the sensor on his habbi hut. I will of had him 2 weeks on Saturday and although there were initial teething problems with him eating and pooping he has a good appetite now BUT will only eat calci worms with maybe 1 or 2 crickets. He's not interested in veg yet but I have a good supply in there. He has a real character about him and doesn't like bed times as his lights come on at 7am and go off at 9pm set on a timer. He also enjoys daily baths and has already shed skin from his head. A couple of things to help you - first see if you can get his basking spot up a couple of degrees (39~42C is their preferred range) without increasing the cool end, overnight temps may drop to around 16C quite safely. Daily bathing is not or should not be part of the standard husbandry see this post viewtopic.php?f=8&t=1372 What are you using for aheat supply? The standard household spotlight (Phillips RO80) is ideal and is much cheaper than the "special" reptile lights. also what are you using for UV? Dragons love assorted worms and they are a little like kids in a lolly shop about them so if possible get him on to crix and as he gets bigger switch him to roaches. As for veg it's a matter of putting asmall dish in early each day and not feeding live food 'til late morning. That way if he's hungry he'll have no choice. Thank you, i'll bathe him less. I have got the temp on his basking spot set to 41.2 now. I have a large vent coming for the cool and with a fly screen in as it seems a little warm, we are constantly assessing this until it arrives with the digital temp gauge. I have a 100w reflector bulb in there for his heat source and a 3ft T8 uv light. 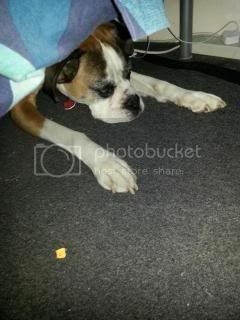 I have put a pic below of his setup, he's is just waking up under his hideout on the pic. (he hates waking up and certainly doesn't like bed time). He runs tapping on the glass at bed time, I presume this is because 1) he doesn't like the lights going off or 2) he wants my attention. Silly question, but how well do you get on with cleaning his poo up on the lino? Ok, just wondered. Beardy's tank never smells for long cuz I don't leave it in there long enough. Hate looking at it! I might have a think about Lino. I have had Anzac for about 5- 6 weeks now, we put lino in his viv as the crickets kept going under the paper, I got an off cut from the local carpet shop for nothing. It is so easy to keep clean.